She’s a woman of color in a white ballerina world. She began her training in Southern California, joined American Ballet Theatre, had a serious injury, recovered and was promoted to principal in 2015. Misty Copeland, right? No, it’s Stella Abrera. A Filipina American, her career trajectory is similar to Copeland’s but without all the hoopla. She and Copeland will alternate in the title role of Alexei Ratmansky’s acclaimed “Firebird” during ABT’s all-Ratmansky engagement at The Music Center’s Dorothy Chandler Pavilion, July 7-10. Copeland’s fame is certainly justified – she is the first African-American dancer promoted to principal at ABT and she takes her role-model status seriously. Abrera has seemingly been more retiring in her career, but has plenty to celebrate. She is the first Filipina American to join ABT and the first to make principal. She was promoted late in life – at least in terms of a dancer’s career. She was 37. 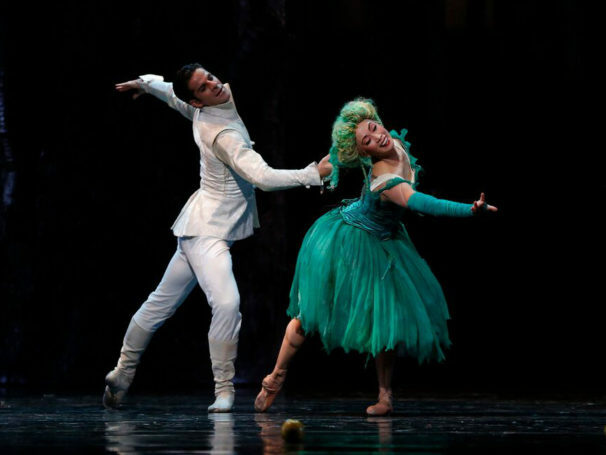 Her big break arrived when, after dancing the role of the Queen of the Willis time and again in “Giselle,” she got an opportunity to dance the title role; she replaced Maria Kochetkova who was forced to withdraw from the season because of an injury. Abrera’s devotion to dance was interrupted when a serious back and leg injury in 2007 sidelined her for more than 18 months. Unwilling to give up a promising career with a company she loved, she fought her way back to the stage. During those 18 months she also experienced two big life losses — her father-in-law and her mentor, Georgina Parkinson, both died from cancer. Abrera feels she gained wisdom and depth from those experiences that she can now invest in her dancing. In LA, she’ll dance at every performance: July 7 and 9 in the Stravinsky-scored “Firebird” (she’ll have the title role on July 8; Copeland has it on July 7 and 9); July 8 and 10 in “Symphony #9,” set to the Shostakovitch score. We anticipate terrific dancing at the Music Center after the Fourth, with Abrera as one of the stand-out principals. Don’t miss it. I remember Stella when I attended Le Studio classes in Pasadena. I admire her perseverance to finally reach principal dancer status.